Jasmine essential oil is known as the 'King of Oils'......in my opinion, a reputation well deserved! Strangely, although it is known as the 'king', it is very much a woman's oil........although, both men and woman can be very attracted by the sensational smell! With its wonderful soothing and sensual aroma, this has been a favourite oil for many for thousands of years.....the name Jasmine comes from the Persian word 'yasmin' which means "a gift from God". The Jasmine is a creeper with white or yellow flowers with an absolutely exquisite scent. It is often used (along with Rose) in the most expensive of perfumes. It is one of the most expensive oils to buy as it is costly and difficult to extract......around 8 million hand-picked jasmine blossoms are needed to produce 1 kilo of essential oil. They also need to be picked at night as their aroma becomes more powerful after dark! An experienced picker can pick up to 15 000 blossoms a night. Now doesn't this make jasmine essential oil really magical! However, although it is expensive to buy, you don't need much because of its high concentration, and the benefits are definitely worth it! Pure essential oil is obtained by traditional enfleurage of the flowers. An absolute is obtained by solvent extraction from the flowers. Sweet, floral, warm and exotic. Blends well with bergamot (citrus oils), cypress, sandalwood, lavender, rose, ylang ylang and neroli. Antiseptic, antidepressant, antispasmodic, aphrodisiac, cicatrisant, galactagogue, parturient, expectorant, sedative, tonic, uterine. See the glossary for definitions! Jasmine is a very soothing, calming and revitalising oil. This makes it very valuable for severe depression..........it soothes the nerves whilst restoring optimism and energy. These same soothing and calming properties are also very helpful with sexual problems such as impotence and frigidity. It is still probably most famous for being an aphrodisiac......bringing out feelings of love and emotional warmth. 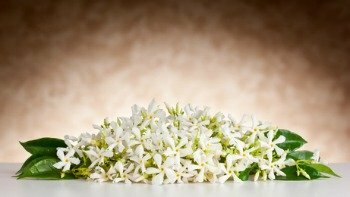 Jasmine oil is uplifting and euphoric and so helps boost confidence, whilst at the same time reducing fears and anxieties. A beneficial oil for soothing coughs, sore throats and laryngitis. Helps ease muscle aches and pains, sprains and stiff limbs. Jasmine is useful for regulating menstruation and easing painful periods. Also helpful in childbirth.........relieves pain and can help speed up the delivery. Jasmine essential oil can help ease post-natal depression. Helps improve the skins elasticity. Also good for stretch marks and scars. Jasmine oil is fantastic in that it tones all types of skin.......greasy, dry, sensitive and skin that is irritated. This oil should not be used during the first 4 months of pregnancy. Put a few drops in a diffuser/burner to ease anxiety and nervousness, and to help lift depression. Also beneficial for relaxation when treating addictions. Put a few drops in a hot bath to help relieve stress and tension. Also good for muscle aches and pains, sprains and stiff limbs. It's a good idea to mix the drops in a small amount of milk first (essential oils mix better with fats) and then add! Use blended in a base oil, cream or lotion to help reduce stretch marks and scarring. Use as part of a blend with other essential oils for aromatherapy massage. Great for stress, depression and helping with breaking addictions. The cost of the jasmine oil should reflect its quality. So be careful..........if you are not paying very much for your oil then the chances are that it is synthesised and the therapeutic qualities are lost! Jasmine essential oil is associated with the sacral chakra and is useful for helping to balance yin and yang. In China they drink jasmine tea daily!